Luiz Gonzaga, foreground, playing with Dominguinhos. Dominguinhos was the hand-picked successor to Luiz Gonzaga, the musician who practically invented the northeastern baião-forró genre in Brazil in the mid-20th century and made it popular throughout the country. Like Luiz Gonzaga, Dominguinhos – born José Domingos de Morais on February, 12, 1941 – was from the interior of Pernambuco (Dominguinhos was from Garanhuns, about 400 kilometers as the crow flies from Gonzaga’s hometown of Exu); also like Gonzaga, Dominguinhos was the son of a small-scale farmer, accordion player and tuner – Chicão. 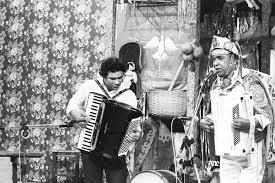 As Dominguinhos describes in this program, he began to perform with two of his brothers at open-air markets, bar entrances and parties when he was seven, and by the time he was eight he was collecting change in a hat to help provide for the family of ten children. 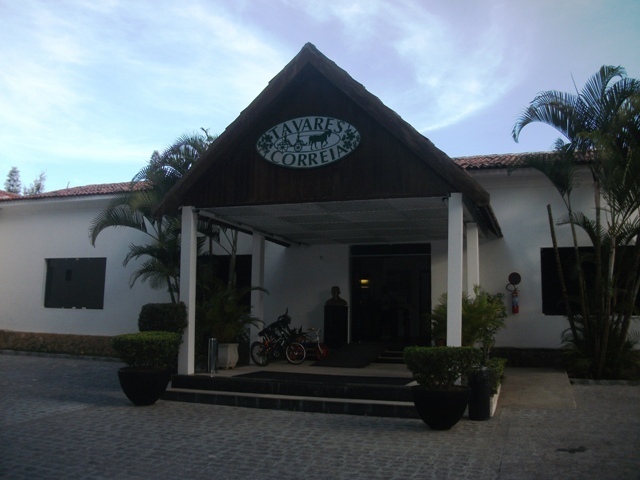 The Tavares Correia Hotel in Garanhuns, Pernambuco, where 8-year-old Dominguinhos played for Luiz Gonzaga for the first time. One place he and his brothers regularly performed was the entryway to the Tavares Correia Hotel. The budding musicians were surprised one day to be invited inside the hotel to play at a banquet: a special guest they’d never heard of was in town and wanted them to perform for him. 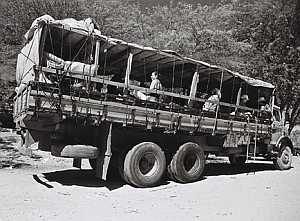 At 13, Dominguinhos moved with his family to Rio de Janeiro on a pau-de-arara truck like this one. Like millions of other migrants who abandoned the arid northeast in the mid to late twentieth century, Dominguinhos made the move with his family to Nilópolis, Rio de Janeiro, on a pau de arara (parrot’s perch) truck after his father gave up farming in Pernambuco. It was an eleven day journey on hard wooden benches. (Around that time, pau de arara was coming into currency as a pejorative term to refer to northeasterners.) Upon arriving in Rio, Dominguinhos and his father hastily sought out Gonzaga, who spoke briefly to Chicão and promptly gave him a new red accordion. Dominguinhos, left, with Luiz Gonzaga. Dominguinhos said that from that point on he was inseparable from Gonzaga. He began to accompany Gonzaga to the studio, but didn’t play with him there until a few years later: In 1957, the two were in a studio packed with members of the press covering Gonzaga’s new release; Gonzaga surprised Dominguinhos by publicly introducing him as his musical successor and inviting him to join him playing “Forró no escuro.” Dominguinhos said he basically began a new life that day. Gonzaga also gave Dominguinhos his artistic name. 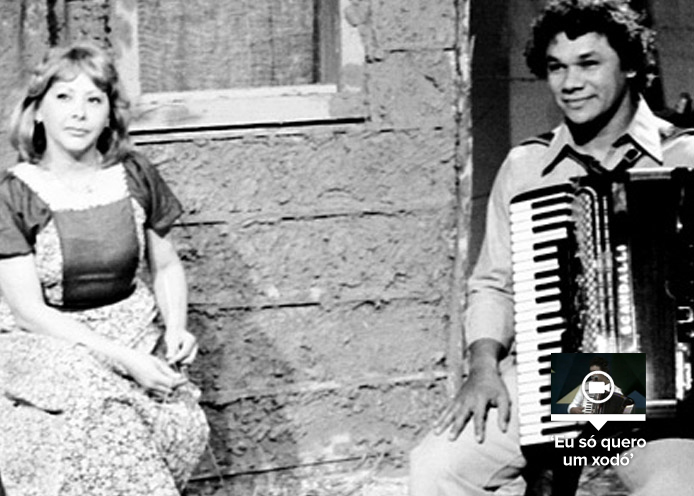 Dominguinhos recalled Gonzaga telling him to scrap his childish nickname — Neném (Baby) — in favor of Dominguinhos (little Domingos), which would also serve as an homage to Domingos Ambrósio, a fellow accordionist Gonzaga had grown close to while serving in the army in Juiz de Fora. Luiz Gonzaga had a notoriously tumultuous relationship with his adoptive guitarist son Gonzaguinha, who was a few years younger than Dominguinhos. Dominguinhos said Gonzaga called him his “other son,” believing he was the accordionist son Gonzaga had always wanted. Anastácia and Dominguinhos met on a tour through the northeast of Brazil in 1967. Dominguinhos never wrote lyrics; he only composed tunes in his head. He was married to the forró singer and lyricist Anastácia for eleven years, from the late 1960s through the late 1970s, and together they composed some of his best-loved songs. Anastácia wrote the lyrics for “Tenho Sede” and Dominguinhos said they struck him as weird at first – particularly “Bring me a cup of water”; but he knew not to question Anastácia too much, and the song became one of his most popular. The couple composed about 210 songs together, including the sensation “Eu só quero um xodó,” which Gilberto Gil released in 1973 and which Anastácia calculates was re-recorded by 440 singers around the world. In the early 1970s, after returning from three years of exile in London, Gilberto Gil – a northeasterner from Bahia – was increasingly exploring northeastern themes and elements in his music. Gil’s producer, Guilherme Araújo, saw Dominguinhos playing with Luiz Gonzaga in 1972 and invited him to work with Gil and Gal Costa. Gil composed lyrics for Dominguinhos’s tune “Lamento Sertanejo,” voicing the sentiments of recently arrived migrants who felt out of place and discriminated against in southeastern Brazilian cities. During these most oppressive years of Brazil’s military dictatorship, calling attention to Brazil’s downtrodden populations – mostly ignored by the state media – represented a less censorable form of protest. 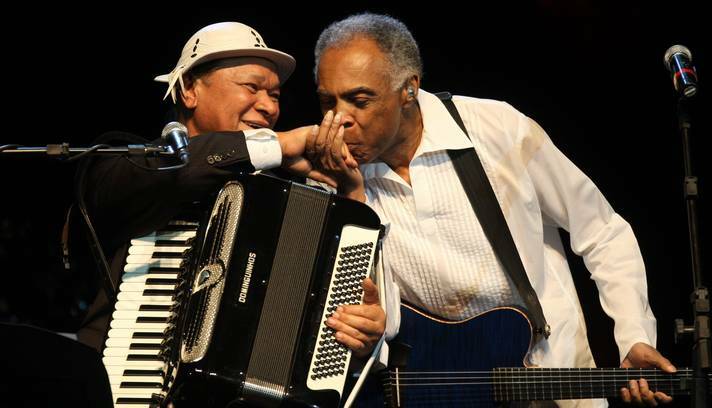 Dominguinhos and Gilberto Gil together on stage in 2010. The 1970s were the peak years of rural exodus in Brazil; destitute northeasterners poured into southeastern Brazilian cities and encountered rampant discrimination and a colder climate and culture. In 1940, about 31% of Brazil’s population lived in cities; by 1970, urban residents accounted for more than 50% of the population, and in 1980, nearly 70%. 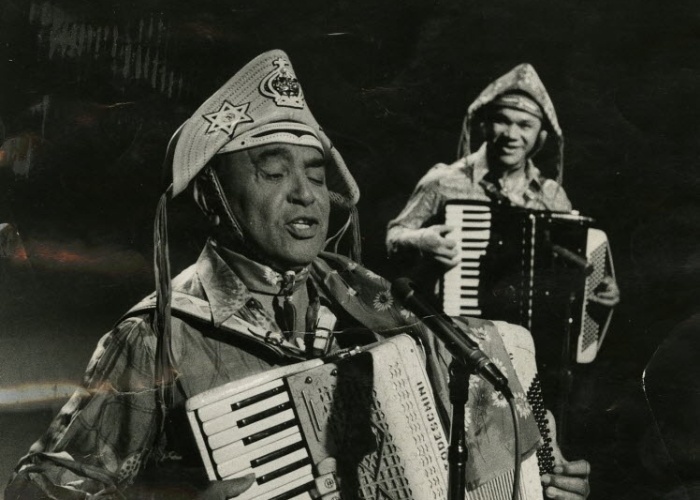 Dominguinhos recalled snide remarks like, “Those yucca-eaters, come here dying of hunger,” and remembered being received on stage with boos and paper airplanes from audiences in São Paulo still prejudiced against northeastern music. But he felt he suffered little discrimination in comparison with Luiz Gonzaga: “I got there and the path was already halfway open for me,” he said, remarking on the progress Luiz Gonzaga had already made in combating prejudices by the time he began performing in Rio de Janeiro and São Paulo. Dominguinhos was widely loved for his spirited performances and sweet, sunny demeanor. He passed away on July 23, 2013, in São Paulo, after a long struggle with lung cancer. He had discovered the cancer in 2007, and a couple years into treatment remarked, “I don’t know how I ended up with this – I never smoked. But there are things that just happen that we’re unable to explain.” He played his final show on December 13, 2012, in Exu, Pernambuco – a tribute concert on what would have been Luiz Gonzaga’s 100th birthday. Dominguinhos playing his final show in Exu, Pernambuco on December 13, 2012, accompanied by the young accordionist Cícero Feitosa. Above, Dominguinhos plays “Lamento Sertanejo” with Mariana Aydar, Hamilton de Holanda, Duani, Siba, Tavinho and Trio+1. And life, is it wonder or suffering? Is it joy or lamentation? What is it, what is it my brother? Gonzaguinha, left, singing with his father, the famous forró singer-songwriter Luiz Gonzaga, in Rio de Janeiro in 1987. O que é, o que é? (What is it, what is it?) is a children’s guessing game in Brazil (e.g.”What is it, what is it, that’s always broken when spoken?”; answer: a secret). Gonzaguinha framed this song on the game: He gives a number of potential, complex descriptions of life, and then, eschewing explanations, settles on the simple answer that children provide – it’s life and it’s beautiful. Luiz Gonzaga do Nascimento Junior (September 22, 1945 – April 30, 1991) was the son of the renowned singer-songwriter Luiz Gonzaga – Brazil’s most legendary forró musician, who popularized the northeastern style throughout Brazil in the 1940s and 1950s – and Odaléia Guedes dos Santos. Because of the timing of Gonzaguinha’s birth, his total lack of physical similarity to Luiz Gonzaga, and Luiz Gonzaga’s likely sterility, Gonzaguinha’s parentage is widely disputed. Nonetheless, the singer’s official website sticks to the story that he was Gonzaga’s biological son. Gonzaguinha’s personality also differed dramatically from his father’s. While “Gonzagão” (Big Gonzaga) exuded cheer and lightheartedness, Gonzaguinha generally came across as bitter and tormented, both in person and in his music. He’d had a difficult childhood: His mother died when he was two, and Luiz Gonzaga left him in the care of friends, Dina and Henrique Xavier. The couple raised Gonzaguinha, who grew up feeling abandoned by his father. Later in life, Gonzaguinha gave Dina and Henrique credit for his music career, saying he learned to play guitar because of them. After a brief and troubled stay with his father when he was sixteen, Gonzaguinha went to study economics in Rio de Janeiro, where he participated in the Movimento Artístico Universitário (Students’ Artistic Movement) – a group of students who got together to play music every Friday and aimed to “break down barriers” in the music market in Brazil. TV Globo created a show based on the movement – Som Livre Exportação (Free Sound Exportation) – hosted by Ivan Lins and Elis Regina. The weekly program, which ran from late 1970 to mid-1971, launched the music careers of group members like Gonzaguinha, Ivan Lins, Aldir Blanc and César Costa Filho. Gonzaguinha initially took great pains to distance himself artistically from his father. But after touring northeast Brazil in 1975, he said he gained greater appreciation for his father’s music and its influence in the northeast. In 1976 he released an LP with a recording of his father’s greatest hit, “Asa Branca,” and the pair performed together for the first time in 1979, in a show – and later a tour – called “Vida do Viajante” (Wanderer’s Life) after another one of Luiz Gonzaga’s most popular songs. Afterwards, Gonzaguinha and Gonzagão both demonstrated a desire to remain closer to one another, until Luiz Gonzaga’s death in 1989. Two years later, Gonzaguinha died in a car accident in Paraná, Brazil; he was 45.